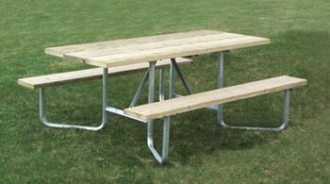 Now every picnic table in your park, campground, restaurant or facility can be fully accessible! This wheelchair accessible picnic table meets or exceeds current ADA guidelines for wheelchair access to picnic tables. Versatile picnic table provides two areas (at ends) for wheelchairs to be used or can be used for additional seating. A non-tip, non-trip walk-through picnic table. Treated pine lumber table top and benches. Hot dipped galvanized 1 5/8 inch frame tubing is all one piece welded construction with cross braces constructed from 1 inch diameter schedule 40 pipe. Assembly fasteners are 3/8 inch diameter hot dipped galvanized carriage bolts. Please call or email for freight quote. Go to top of this Outdoor Picnic Table, 6 ft, Treated Pine, Universal Access Galv Frame page.